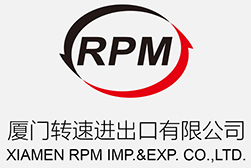 Rimpex Rubber supplies roll type rubber race tracks building machinery set made in China. Fineness rubber powders have wide application fields, it could be reused directly in all kinds of rubber products with rubber powders as main raw materials such as rubber race tracks, rubber floor boards, rubber roof tiles and modified asphaltum by rubber powders, etc. This factory has developed and manufactured equipments to fine crush waste tyres at normal temperature for years, and it also do further research to make full advantage of fine rubber powders for multifarious applications. Of course, it combines its predominance in equipments production and successfully makes out rubber race tracks building machinery set which could produce roll type rubber race tracks. Such rubber race tracks building machinery set adopts one top-mould, two bottom-moulds, bidirectional open type structure, 21 meters super long flat slab, high temperature and high pressure vulcanizing process to build rubber race tracks directly in one step. The rubber race tracks made from such building machinery set are with characteristics such as less joints, higher output capacity, stable quality, perfect performance, low energy consumption, non pollution, etc. Its main technical parameters keep ahead in China and advanced in the world. This rubber race tracks building machinery set has applied China patent. The strongpoints of such rubber race tracks building machinery set are as follows: The bottom-mould plate adopt bidirectional bascule, it could realize bidirectional open type feeding materials and continuous production at high working efficiency by the in and out draught of bottom-mould's bascule base and external rails. 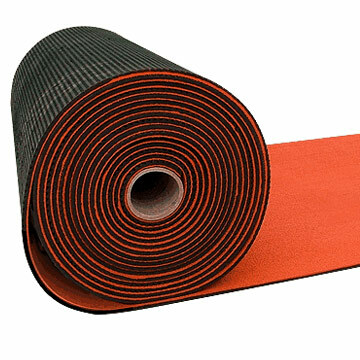 By making use of heat insulation layer materials' solidifying molding process and multi cylinders synchronously control technology, a standard 20m long prefabricated rubber race track could be with only 3% error in thickness. The excellent circulating water cooling system greatly improves the cooling speed and the building precise of rubber race tracks. 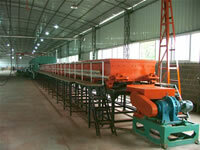 First start steam heating system to heat the top-mould plate and bottom-mould plate in main frame of machinery set. Press "Start" button, the bottom-mould will be automatically moved outwards till outside of main frame of machinery set, then begin to feed materials. After feeding materials, repress "Start" button, the bottom-mould will be reset back to main frame, start hydraulic system to close mould via contact switch and warm up the mould. Set the required parameters of vulcanizing time, temperature and pressure to start vulcanization. After some time vulcanization at constant pressure, the timing system will automatically execute demoulding procedure, at the same time, another bottom-mould with already feeded materials will move into main frame from reverse side to start vulcanization continuously. For example, it takes only 20 minutes to produce a prefabricated rubber race tracks with 20 meters long, 24.4 square meters size. ---It needs around 10 technicians to debug around 7 days. 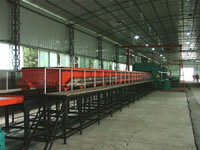 There is a prefabricated type rubber race tracks production line in normal production now. Welcome you anytime to have a look at the factory.